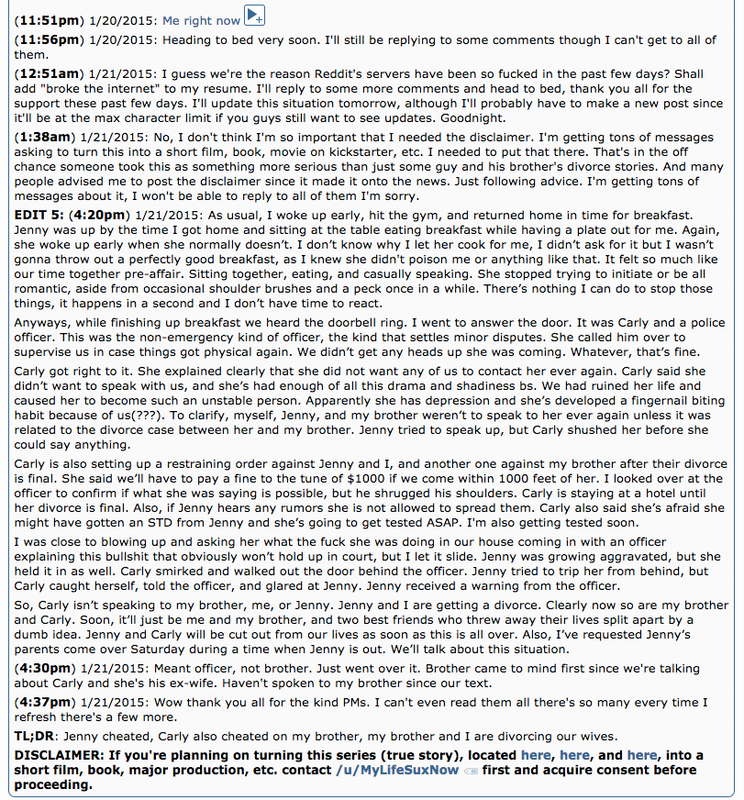 Over the past week, millions of Redditors have been following the live blogging event of user ‘MyLifeSuxNow' who wrote of how he discovered that Jenny, his wife of 8 years had been sexting another man. When she said she was going away for a girl's weekend with her sister-in-law Carly, that is his brother's wife, he got suspicious and hired a private investigator to tap her phone and follow them. What he found out is devasting and heartbreaking. Not only was his wife Jenny cheating with a man called Zack, his brother's wife was also in on it. [Read the first update here and update before last here]. Many people continue to doubt the story by MyLifeSuxNow insists it is true. He says he's in the process of divorce against Jenny and his brother will also divorce Carly. In the most recent updates, Carly confessed to foursomes and swapping with Jenny and the men they cheated with as a way of spicing up their life. After the confession and with the threat of divorce, Carly took out restraining orders against all of them. Maybe the legal and police involvement is the reason MyLifeSuxNow deleted all the posts, but I have a screenshot below. Click on the images to read..